LeBron James is a once-in-a-lifetime player. I just watched his Top 10 plays on Youtube before writing this and now I’m pumped up. However, I’m confused as to why LeBron would choose to join the Los Angeles Lakers. The Lakers already have a legacy with or without James. Even if he wins multiple championships in LA, he will just go down as another Laker great, instead of arguably the best player of all time. His ability as a basketball player is unlike anything this planet has ever seen before. His combination of power, speed, and all-around athleticism has changed the game forever. Throughout the years, James has played for three different franchises. He started his career with the Cleveland Cavaliers as the hometown hero. He took the Cavs to the NBA Finals in 2007 where they ended up losing to the San Antonio Spurs. After not being able to make a return trip to the NBA Finals, LeBron joined the Miami Heat in 2010. In Miami, King James joined the likes of Dwayne Wade and Chris Bosh and formed a dominant team. The Heat ended up winning back-to-back championships in 2012 and 2013. After LeBron’s stint in Miami was done, he chose to go back home and re-join the Cavaliers. He led the Cavs to their first NBA championship in franchise history and rightfully earned his place as Cleveland’s Prodigal Son. 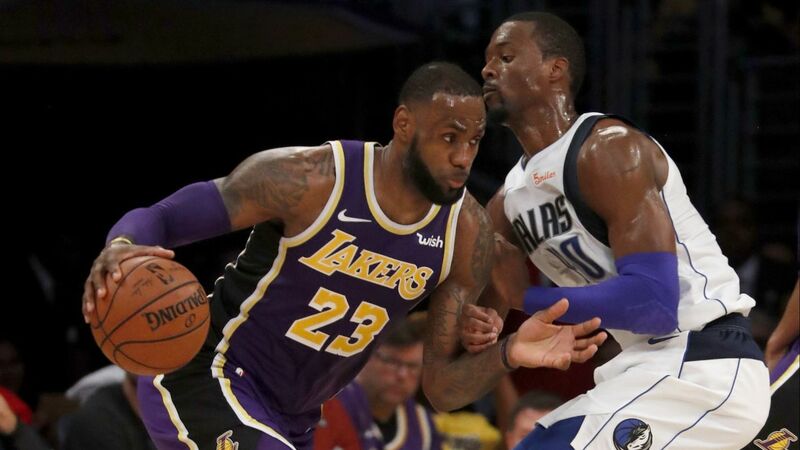 After losing to the Golden State Warriors in back-to-back NBA Finals, LeBron has decided to leave Cleveland and join the Lakers. Now, I will be the first to admit that my personal feelings toward James changes on a year-to-year basis. I loved LeBron in his first stint in Cleveland. Then I absolutely despised the man when he left for Miami. Then I treasured him again when he went back home. I think it is important to note that my Dad is from Cleveland, which explains why I felt so passionate about James leaving and rejoining the Cavs. However, this past move to the Lakers is a different kind of emotion. I feel like LeBron gave up his chance to be the greatest basketball player in NBA history by joining the Lakers. As a basketball purist, I would have loved to see King James join any other franchise in the NBA, with the exception of the Boston Celtics. I myself actually am a Lakers fan ever since the Seattle SuperSonics got taken away. (Sorry, I had to sneak that in.) Nevertheless, it’s hard for me support this move. I just don’t understand it from a basketball standpoint. If James truly wanted a chance to win NBA championships, then he should have stayed in the Eastern Conference. LeBron and the Cavs won the East four consecutive years. Now LeBron has to deal with the Warriors before he even reaches the NBA finals—if he even gets a shot at the Dubs in the postseason. I’ll be the first to admit that the East has improved in recent years, but it is still not as loaded as the Western Conference. In the West, in addition to the Warriors, you have to deal with the Houston Rockets, a dangerous Utah Jazz team, a Gregg Popovich-coached San Antonio Spurs, the Portland Trail Blazers and the Anthony Davis’s, aka the New Orleans Pelicans. It seems to me like James had the attitude of I would rather lose early in the playoffs instead of making it all the way to the NBA Finals and losing again. I think that if James had stayed in Cleveland and the Cavs added one more elite player they could have beaten the Warriors. Nonetheless, I do understand why LeBron would like to live in LA instead of Cleveland. King James has a budding Hollywood career and has an opportunity to expand his professional life beyond basketball. Furthermore, as my Dad has told me many times, nobody wants to live in Cleveland during the winter. But this is the problem: Why is LeBron seemingly focusing on his career after basketball? From what we’ve all seen from him on the court, he has shown no signs of slowing down. He is still currently the NBA’s most dominant player. All you have to do is watch a game and it is very obvious who is the King of the NBA. There are still some Lakers fans who are unsure of what to make of this move. Furthermore, there are a few die-hard Kobe Bryant fans who dislike the move entirely. Nevertheless, one thing is for sure: If King James brings a title to the Lakers franchise, he will cherished in LA forever. However, players like Bryant and Michael Jordan never had to switch teams to win NBA titles, LeBron did three times. I do understand that this is a new era of basketball, but he still had to chase championships. The best players in NBA history don’t chase titles, they just win them.